Two penguins are on an iceberg. 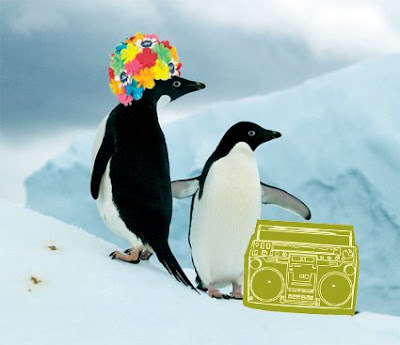 One had a swimcap, the other had a boombox. That’s it. If there’s a punch line, I can’t find it. Figuring this to be a setup somehow deprived of its follow-through, I Googled “penguin swim cap boom box joke”. Nothing. Then I tried “One had a swimcap, the other had a boombox” and got a few pages of joke websites listing the same joke. All did so with swimcap instead of the more standard swim cap, so it’s probable that they all just copied each other’s jokes, including this one, whose original, erroneous posting on some site has now been preserved for eternity. That’s the only explanation I can think of, because I otherwise do not understand this joke. Anyone? Is this funny? Does it even make sense? Maybe it was originally written to detect automated webcrawlers, copying anything labeled as a joke? I have to say it reminds me of the "no soap, radio" jokes, where the whole point is that they don't make any sense, but kind of sound like they should. Nathan: I don't think I know about the "no soap, radio" joke. Can you elaborate? This graphic would be perfect for an ad for the San Ysidro Ranch, though.